Ever wonder what would happen if you took Dark Souls, mixed it with Super Mario meets Ninja Gaiden, and smashed it into a 2D space?” Me too! 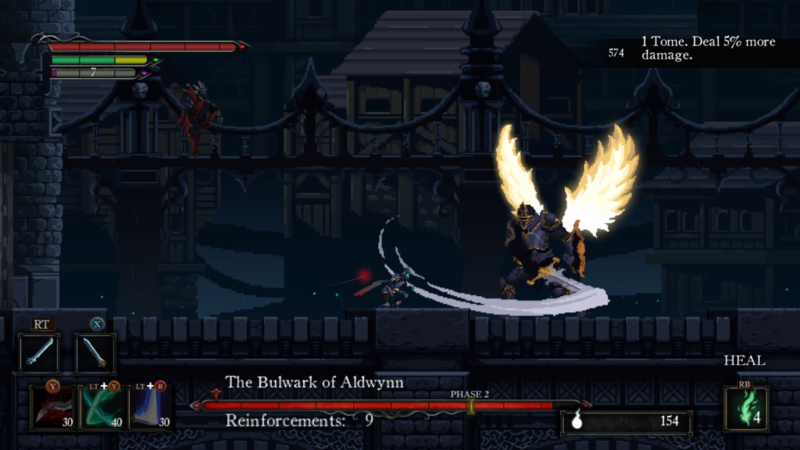 Well, that’s exactly what developer White Rabbit has done with its side-scrolling, Dark Souls meet Metroid action RPG Death’s Gambit. After countless hours of picking myself off the ground replacing a controller from rage-inducing boss fights and exploring this soul-crushing deathfest, I’m here to give some thoughts on this title. So grab that coffee, kick back and enjoy our review of Death’s Gambit from Developer White Rabbit. Set in a medieval dark fantasy setting, Death’s Gambit opens with an interesting tale of you essentially making a deal with Death. The conditions of the deal and the reason behind said deal begin to unfold as you begin your adventure. Interestingly most of the story is told in segments after your character dies. Now being that you have a deal with Death, he is quick to pick you up, dust you off and send you on your merry way to hack and slash through the many enemies the game has to offer. However, it is in these moments between death and life that a series of flashbacks and commentary unfold revealing a dark and sad story. It’s an interesting and refreshing take on storytelling and one that helps sooth the aforementioned rage moments that happen after dying for the umpteenth time. 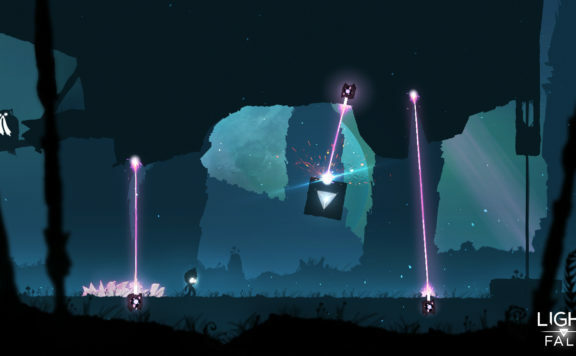 Die you will in this platforming slashfest and by die, I mean die a lot. Combat is slow and methodical which means the standard wack til its dead style of gameplay will actually lead to death just not your enemies. Timing is key to landing hits and with a variety of weapons at your disposal. You’ll need to take time to learn which weapons work best for you. 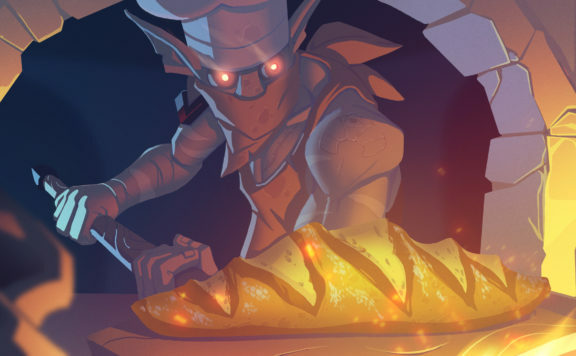 Your character will also have access to a host of abilities that are actually tied to the weapons you currently have equipped so be careful about which abilities you purchase because all sales are final. If you lack the proper weapon to correspond with your equipped ability it will simply sit there and mock you as you mash the ability button in vain. Thankfully said abilities can be swapped at shrines littered throughout the game meaning that no decision is final. Combat at times can feel a bit slow and one misstep seems you combat locked until the animation is finished meaning that each action can have devastating consequences. This seems to be by design as the game seems to take some notes from Dark Souls with its combat style, rewarding patience and planning over mashing and…well… mashing. Boss fights in particular highlight just how rewarding and punishing the combat can be, so expect to die a lot as you learn each boss’s abilities and timing. It’s a system that some will love but others will certainly hate. 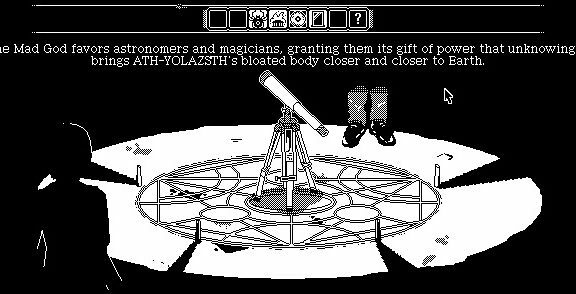 Visually Death’s Gambit is a treat with its pixel art style beautifully highlighting a dark and gritty setting. Arguably it’s some of the most detailed pixel art I’ve seen. The world itself is a desolate masterpiece conveying a troubling place. The world itself feels mysterious and begs to be unraveled and explored. This coupled with the aforementioned storytelling style creates an experience that is captivating and intriguing. The soundtrack for this title also deserves mentioning as it perfectly captures the feelings players experience when exploring the world and story. The sound team over at White Rabbit have done a wonderful job composing the tracks for each part of the world and the main theme itself is something I could spend hours listening to on repeat. 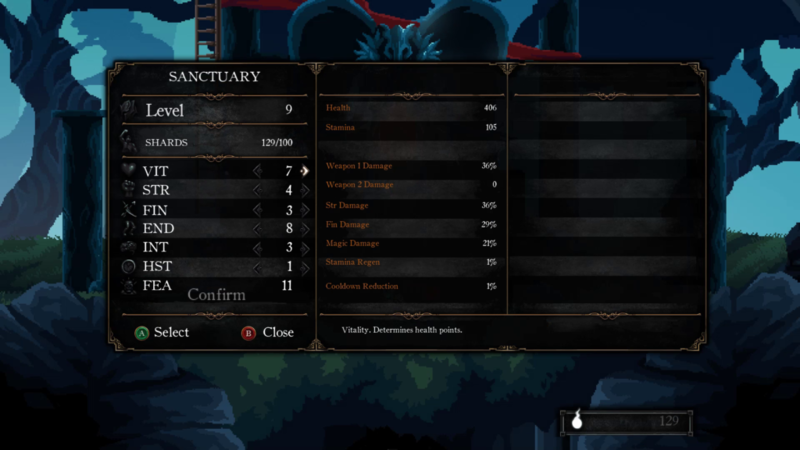 The game has several RPG elements including a standard stat leveling system, loot, special items and abilities all of which work together to help you shape your experience. Stats are upgraded at shrines by spending the souls you’ve collected along the way with each stat lending itself to certain weapons. Abilities are also purchased with souls and can be found from various vendors and NPC’s in the world. Loot is dropped from enemies or purchased at vendors for all your customization needs. 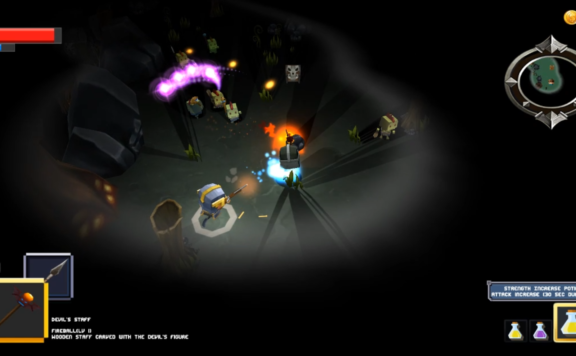 Each system works well in its own right and together complete a solid RPG experience. As much as I’ve enjoyed many elements of Death’s Gambit it’s not without its faults. 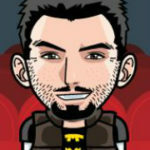 As mentioned the combat system rewards patience, precision, and strategy. While all of these things are fine the combat can still feel clunky leaving me struggling at times to engage in boss fights effectively. Navigating the world, especially while jumping has a tendency to feel a bit floating for lack of a better term. As a result more than once the response time from when I clicked the jump button to when I jumped felt slightly delayed resulting more than once with me having to climb all the way back up to wherever I was trying to get to. These two things, in particular, take away from what is otherwise a dark and satisfying Metroidvania meets Dark Souls experience. Despite its flaws, I appreciate Death’s Gambit and what it has accomplished. 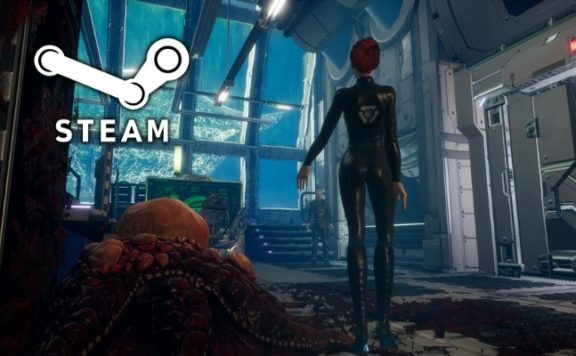 It offers a challenging, story-driven platforming experience that will reward the patient and methodical. 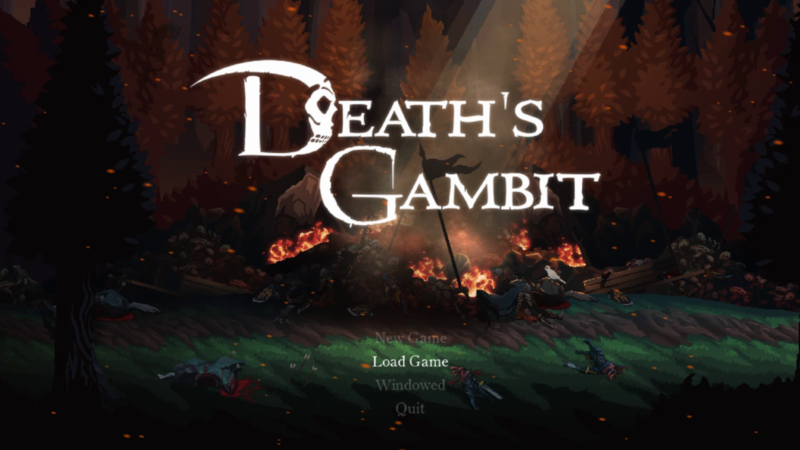 Wrapped in a beautiful pixel art veneer and topped with a wonderful soundtrack, Death’s Gambit is a treat for those willing to spend the time to master its combat and enemies. Will it appeal to everyone, absolutely no! However, much like games like Dark Souls, I don’t really think that’s the point. 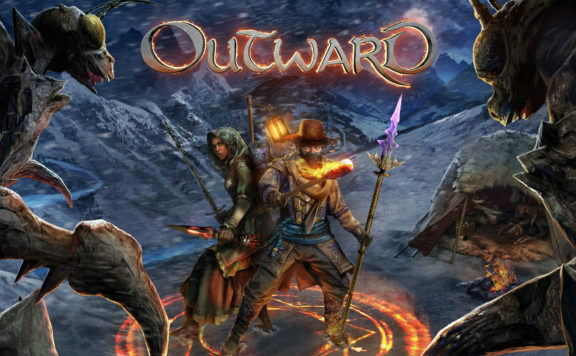 Outward Review – A mash up of genres that tries to stand out.